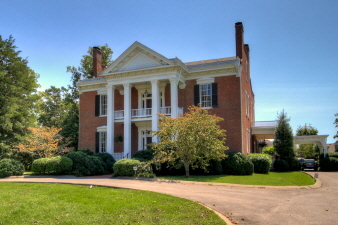 Additional Features and Amenities Daniel Smith Donelson built Hazel Path Mansion in 1857. The brick was made on the site and stone was quarried nearby. The original home consisted of nine rooms in the main structure. The foundation and side steps are stone which were hand hewn. The fireplaces were coal burning and the large doors are painted to resemble mahogany. The downstairs floors are oak and the upstairs floors are poplar.